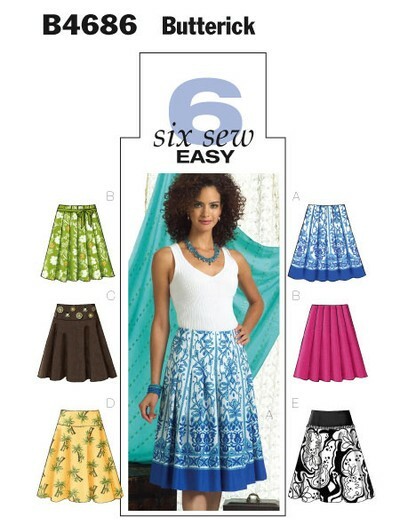 Below mid-knee skirts A, B have pleats, waist facing and left side zipper closure. A: made with a border print. B: ribbon ties. C, D, E: self faced yoke, flared below mid-knee skirt and back zipper closure. C: decorative buttons on front yoke. E: contrast yoke with purchased trim inserted between yoke and skirt. Notions description...NOTIONS: Skirt A, B, C, D, E: 7" Zipper, Hooks and Eyes. Also for B: 11/2yds. of 1" Grosgrain Ribbon. For C: Assorted Decorative Buttons. For E: 11/2yds. of 3/8" Edging. Skirt A: Border Print. Skirt B, C, D: Lightweight Broadcloth, Lightweight Denim and Lightweight Linen.